“Bird in Paradise” will be on display in the California State Capitol for 18 months starting next week. I’ve been selected to represent my State's District in the California State Senate Biannual CA Contemporary Art Collection. There are 40 Districts. A catalog of the art on display will be produced. 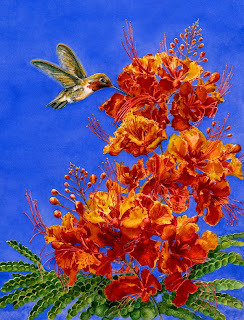 "Bird in Paradise" is the poster art for the 2009 Indian Wells Arts Festival. Boy, am I having a good week! Very nice!I am very happy for you. Congratulations Diane. You deserve this recognition and as so happy for you. Thanks Irit. Thanks Mollie. This is just too much fun! Congratulations! Wow, things are going great for you! Yeah, Thanks Ed. I'm on cloud nine or maybe even ten. Congratulations! What an honor! It couldn't happen to a nicer gal. Awwww shucks. Thank you Sheila. Congratulations and wow, I'm not surprised! Thank you Trevor. I love your work. So am honored by your comment. Thank you Karie-Ann. Your work is beautiful. Seems that you are having a GREAT week...congratulations it is well deserved! Thanks Dana. This week has been amazing! Gonna be hard to beat.